Do you remember going to your uncle's farm as a child and helping him with his farm work? 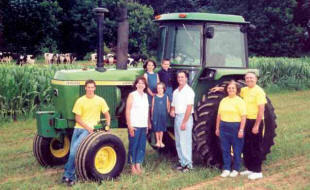 Our working farm has been in the family for seven generations. Come rekindle your fond memories with your children or gra ndchildren. Join us for a walk down memory lane as you sit on our porch and watch the grazing in the pasture by the creek. On October 17, 2005, our bank barn, built in 1760, was destroyed by an arsonist. In the weeks following the fire, our community helped us recover from this devastating tragedy. Our barn is now restored, thanks to the help of many family and friends. For the story of our Amish barn raising click here. Filled with even more goods. That can be fed by hand. Through a cozy, quiet night.